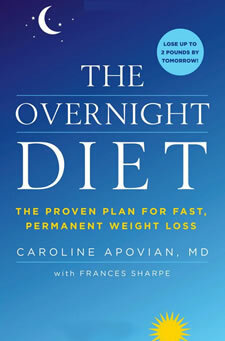 The Overnight Diet is written by Caroline Apovian, MD, who is a weight management expert and has served as a nutrition consultant to NASA. The Overnight Diet basically consists of two stages, The 1 Day Power Up and The 6 Day Fuel Up. The diet begins with a one-day plan where you take a temporary break from solid food. For the entire day you will enjoy a variety of delicious smoothies, while avoiding all other foods. This jump-starts fat burning and weight loss, so you lose weight overnight. Following your day of smoothies you then follow a six-day eating plan to keep you burning fat as you eat a variety of foods. This part of the Overnight Diet is based on a “protein sparing modified fast”, which is designed to preserve lean muscle. Apovian explains that the body does not store amino acids, so protein must be consumed every day to maintain lean muscle mass. She recommends a protein intake double that of the RDA because her research and experiences shows this is optimal for weight loss and metabolism. Every day you will consume 1.5 grams of protein per kilogram of ideal body weight. So if your ideal weight is 130 pounds you will need a minimum of 89 grams of protein a day. No food is completely off-limits during the 6-Day Fuel Up. You can also eat as much fruit and non-starchy vegetables as you like. Lean beef, lean pork, tuna, salmon, cod, shrimp, chicken breast, turkey breast, eggs, tofu, tempeh, seitan, whey protein, Greek yogurt, fat-free milk, soy milk, almond milk, coconut milk, peanut butter, avocado, oatmeal, whole wheat pasta, brown rice, berries, apples, grapes, pineapple, spinach, kale, cauliflower, lettuce, olive oil, Truvia, Splenda. Once you have completed the 6-Day Fuel Up you go back to the 1-Day Power Up again. Then you will continue the cycle until you achieve your goal weight. Alternating back and forth between these two phases is the secret to keep the fat coming off and preventing plateaus. The focus of this plan is about maintaining and adding lean muscle mass. So you don’t have to do a lot of aerobic exercise to be successful. Instead you will concentrate on strength-training combined with short cardio bursts called “Rev Up Blasts”. These workouts burn a lot more fat than doing strength and cardio training separately. The workout routine takes 21 minutes and should be done four times a week. It can be adjusted to suit all fitness levels. The Overnight Diet: The Proven Plan for Fast, Permanent Weight Loss retails at $24.99. High protein intake reduces appetite and helps maintain lean muscle. Cycling between two diet phases reduces the tendency to plateau that generally occurs with long-term dieting. Encourages consumption of fresh fruit, vegetables, healthy fats and whole grains. No food is completely off limits. The Overnight Diet includes meal plans and recipes. Workouts are very time efficient. Protein recommendation is double the RDA amount, which is controversial. Necessary to measure and limit portion sizes of complex carbohydrates and fats. Some dieters may not have the time to prepare the recipes for breakfast, lunch and dinner. Advocates the consumption of processed protein powders and artificial sweeteners. The Overnight Diet is a rapid-weight loss plan involving a one-day liquid diet, followed by a six-day high protein diet. Following this diet can help you release excess fluids so that you feel lighter and healthier. However, long-term fat loss will occur more slowly and will be primarily due to a reduced intake of calories.